What if everything which we’ve always wanted are already inside of us? Think about it. Why do we want the expensive cars, houses, bags and watches? Why do we want the perfect relationship with the people we love? Why do we want to be healthy? We want what we want because of what we think achieving it will make us feel. It is not the car(s) that matters...it is the feeling we think having that car will give us. Gautama Buddha was born a prince. However, upon seeing the sufferings of people outside of his palace, he decided to seek answers. After a long spiritual search, discovered the state of enlightenment...otherwise known as Buddhahood. This audiobook is not about the life story of Buddha. It is, however, about the life teachings of Buddha. Quotes are so special because they provide us a foundation for teaching, analyzing, and relating... and yet...they do not tell us what to think and how to think. It is absolutely up to our own will on what each quote means to us. This book has greatly inspired, motivated me with the wonderful facts it. Ever since I reviewed this book, it has greatly influenced my thinking and usage of my inner strength. This book will expose you to a great deal of knowledge on what you cannot be limited to or not and you will start to see life in a different way that is practical and the understanding of how things are the way they are. Your worst enemy cannot harm you as much as your own thoughts unguarded, but once mastered, no one can help you as much, not even your father or your mother. There's this moment in life where we need to step back and contemplate things around us before engaging into more things. The book's content were pretty much detailed on to it's words. It helps you a lot when it comes to meditating and relieving from stress and just be at peace. It can help you think through thick and thins in life. This kind of religion is one of the most likely worth to be worshiped for. This book's just telling the basics and some guide to help you from doing the said writings on the book. Definitely going to commend this to my fellow friends that are interested in this kind of stuff. There are a lot of books about Inner Peace, Happiness, and Enlightenment. And I've listyen a lot of them, but when I listen this book, I've realized that those books about achieving Inner Peace, Happiness, and Enlightenment. I just haven't noticed because I always associate Buddha with religion, but after listening this book I realized that Buddha Quotes is nfor Inner Peace, Happiness, and Enlightenment. This book talks about everything from Buddha Quotes and peace into your lives all the way back to the basic original Quoteson Buddha. I'm looking for more peace in my life. I'm trying to train myself to be kinder and gentler me, so that this will spill over to everything and everybody else in my life as well. I cannot express into words how happy I am I came across this book. Such a to the point, logical and common sense approach to self improvement and inner peace. I recommend this for listeners of any age . Each person is an individual, living in a society with other individuals. To do this harmoniously, Buddha Quotes is constantly required. I like the thought of incorporating Buddha Quotes into our life. While a lot of people are inspired by Buddha Quotes, this caught my interest to actually learn more about Inner Peace, Happiness, and Enlightenment. Many people are striving to work hard in order to live a satisfying life but end up living exhausted. From this book, I realized that Buddha Quotes seems idealistic. However it makes you ponder and think of turning them into realization. This book is for those who are seeking for Inner Peace, Happiness, and Enlightenment .The book Quotes talks about its roots , I believe that Buddha Quotes helps you become calmer and have a steady mindset. This really helped me understand the book later on and I knew exactly what the writer was refereeing too every time. It's a great feeling to listen this kind of book. I thoroughly enjoyed the inspirational messages as they would encourage a day of love and positive thoughts. For Inner Peace, Happiness, and Enlightenment . Xabier K. Fernao is a wonderful writer. Unlike many, many, many other books on Buddha Quotes, this book attempts to explain the Buddhist teachings. 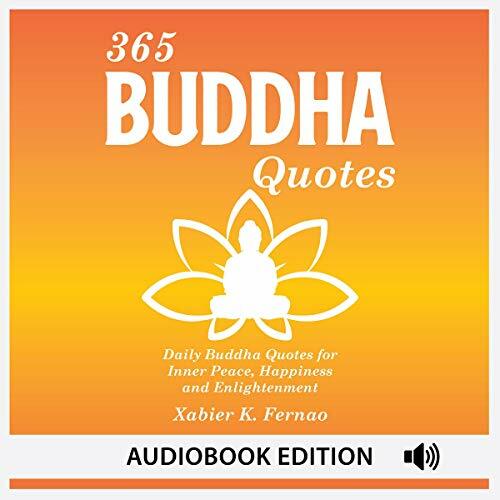 Where most Buddha Quotes books get lost in glowing exhausting praises of how wonderful Buddha Quotes are, while actually never getting around to explaining the Buddha Quotes, this book presents a loving detailed Buddha Quotes . If you're curious about Buddha Quotes, start here. If you're still curious, this gives you a center to branch out from. Thanks, Xabier K. Fernao for showing that Sal who Buddha is. Buddha unlike Jesus actually did things. we have no real proof that Jesus walked on water. the Bible is not real proof. Jesus could be some mentally ill person for all we know Sal. Excellent collection of Buddha quotes. And a great way to remind ourselves of what's truly important in life vs what is simply ego gratifying and doesn't contribute to our genuine long term happiness or feelings of contentment, peace, or serenity. This book is very positive and is a great way to support you and anyone you care about, also it lets you get connected with your spiritual side. Love this book . The quotes give me Inner Peace, Happiness, and Enlightenment. Please add more !! Can't say enough about this one. A sweet compilation of life changing daily life from ancient times. Leading the understanding mind to no mind. The quotes contained in this book was very helpful to me, I'll remember to re-listen them on a regular basis Will be good to revisit periodically. That is so really amazing that will be able to help us. To achieve happiness using Buddha Quotes as my guide. Forget the past ,just move on love yourself. It also help us to be more happy in our everyday life.Perfect to have it , a lot of important information to learn. I really love it, I will apply it to my self. After a book about Inner Peace and happiness I was intrigued to learn more about Buddha Quotes, so I decided to listen this book. I was pleasantly surprised by how much useful and interesting information this book contains! I enjoyed this book. I will keep this quick guide close by so I can reference it often. This book isn't extremely long, but I would recommend this book.